This web page provides the dimensions of this new high performance VSAT as used for the HX50 VSAT services by Bentley Walker in Europe, Middle East and Africa. The antenna uses a mode matched feed which cancels the cross-pol interference which is a feature of all single reflector, offset fed dishes. The only comparable performance antennas are Gregorian designs with dual reflectors. The cross-pol cancellation requires that the fat part of the feed throat is directly towards the feed arm in all circumstances. Horizontal nominal polarisation is shown and adjustment to any polarisation is possible by rotating the entire dish through 360 deg using a 3-axis positioner behind the dish. You can also change the polarisation by specific angles 0, 30, 60, 90 deg using the flange with 12 holes between the spacer tube and the filter assembly. Max depth = 9.1 cm at 64 cm up, approx in line with the upper pair of fixing holes (use straight edge or fishing line up the front) . There are 6 hemispherical reference holes, 0.25 inch diameter; 4 around the edges of the curved surface and two either side, near the middle. The focal length is the distance from the phase centre of the feed (approx where the throat transitions to the cone) and the apex of the parabola which is probably just below and off the lower edge of the curved surface. 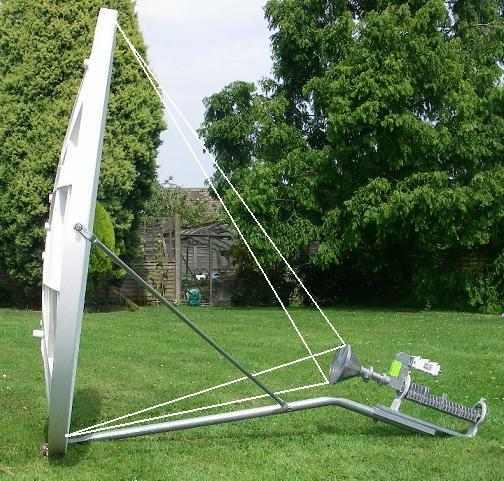 120cm 0.8 f/d Ku band: A=33.72" B=36.97" C=51.54" D= 48.28" Feed Dia=5.76"